The flag of South Africa was designed in March 1994 and adopted on 27 April 1994, at the beginning of South Africa's 1994 general election, to replace the flag that had been used since 1928. The new national flag, designed by the then State Herald of South Africa Frederick Brownell, was chosen to represent the country's new democracy after the end of apartheid. a horizontal bicolour of red and blue with a black isosceles triangle based on the hoist-side and a green pall, a central green band that splits into a horizontal Y, centred over the partition lines and was edged in both white against the red and the blue bands and gold against the triangle, in which the arms of the Y ends at the corners of the hoist and embraces the triangle on the hoist-side. The flag has horizontal bands of red (on the top) and blue (on the bottom), of equal width, separated by a central green band which splits into a horizontal "Y" shape, the arms of which end at the corners of the hoist side (and follow the flag's diagonals). The "Y" embraces a black isosceles triangle from which the arms are separated by narrow yellow bands; the red and blue bands are separated from the green band and its arms by narrow white stripes. The stripes at the fly end are in the 5:1:3:1:5 ratio. The central design of the flag, beginning at the flagpost in a "V" form and flowing into a single horizontal band to the outer edge of the fly. According to official South African government information, the South African flag is "a synopsis of principal elements of the country's flag history." Although different people may attribute personal symbolism to the individual colours or colour combinations, "no universal symbolism should be attached to any of the colours." The only symbolism in the flag is the V or Y shape, which can be interpreted as "the convergence of diverse elements within South African society, taking the road ahead in unity". From time to time explanations of the meanings or symbolism of the flag's colours are published in various media, including official government publications and speeches by government officials. Three of the colours — black, green and yellow — are found in the flag of the African National Congress. The other three — red, white and blue — are used in the modern flag of the Netherlands and the flag of the United Kingdom; the colours white and blue were also found in the old flag of South Africa. Former South African President F.W. de Klerk, who proclaimed the new flag on 20 April 1994, stated in his autobiography, The Last Trek: a New Beginning, that chilli red was chosen instead of plain red (which Anglo-Africans would have preferred) or orange (as Afrikaners would have preferred). The Anglo-Boer War between 1899 and 1902 ended with the Treaty of Vereeniging on 31 May 1902 and resulted in what is now South Africa falling under the British Union Flag. The former Boer Republics of the Orange Free State and the Zuid-Afrikaanse Republiek (Transvaal) became British colonies along with the existing Cape and Natal colonies. Each was also entitled to a colonial flag following in the British tradition. The South Africa Red Ensign was South Africa's de facto national flag between 1910 and 1928 and was flown at times from Government buildings. These flags never enjoyed much popular support due to the animosities lingering after the Anglo-Boer War. The Afrikaner descendants of the Dutch settlers from the former Boer Republics found the prominent position of the British Union Flag to be offensive while the English-speakers saw any move to remove it as an Afrikaner plot to deprive them of their imperial symbol. The three flags in the centre representing the former British colonies of Cape Colony and Natal with the Union Jack on the left, followed by the flags of the former Boer republics of Orange Free State and the South African Republic on the right. The Union Jack is shown with the hoist on the right. Due to the lack of popularity of these flags, there were intermittent discussions about the desirability of a more distinctive national flag for South Africa after 1910,:70 it was only after a coalition government took office in 1925 that a bill was introduced in Parliament to introduce a national flag for the Union. This provoked an often violent controversy that lasted for three years based on whether the British Union Flag should be included in the new flag design or not. The Natal Province even threatened to secede from the Union should it be decided to remove it. Finally, a compromise was reached that resulted in the adoption of a separate flag for the Union in late 1927 and the design was first hoisted on 31 May 1928. The design was based on the so-called Van Riebeeck flag or "Prince's Flag" (Prinsenvlag in Afrikaans) that was originally the Dutch flag; it consisted of orange, white, and blue horizontal stripes. A version of this flag had been used as the flag of the Dutch East India Company (known as the VOC) at the Cape (with the VOC logo in the centre) from 1652 until 1795. The South African addition to the design was the inclusion of three smaller flags centred in the white stripe. The miniature flags were the British Union Flag (mirrored) towards the hoist, the flag of the Orange Free State hanging vertically in the middle and the Transvaal Vierkleur towards the fly. The position of each of the miniature flags is such that each has equal status. However, to ensure that the Dutch flag in the canton of the Orange Free State flag is placed nearest to the upper hoist of the main flag, the Free State flag must be reversed. The British Union Flag, which is nearest to the hoist and is thus in a more favoured position, is spread horizontally from the Free State flag towards the hoist and is thus also reversed. Although placed horizontally furthest from the hoist, to balance the British Union Flag, the Vierkleur is the only one of the miniature flags which is spread in the same direction as the main flag. This compensates for its otherwise less favourable position. In this arrangement, each of the miniature flags enjoy equal precedence. Note that the miniature flag of the Orange Free State contains a miniature of the Dutch flag, making the old South African flag the only former national flag in the world containing a flag in a flag in a flag. The choice of the Prinsenvlag (which was believed to be the first flag hoisted on South African soil by Jan van Riebeeck of the VOC) as the basis upon which to design the South African flag had more to do with compromise than Afrikaner political desires, since the Prinsenvlag was politically neutral, as it was no longer the national flag of any nation. A further element of this compromise was that the British Union Flag would continue to fly alongside the new South African national flag over official buildings. This dual flag arrangement continued until 1957 when the British Union Flag lost its official status per an Act of Parliament. Following a referendum the country became a republic on 31 May 1961, but the design of the flag remained unchanged. However, there was intense pressure to change the flag, particularly from Afrikaners who still resented the fact that the British Union Flag was a part of the flag. In 1968, the then Prime Minister, John Vorster, proposed the adoption of a new flag from 1971, to commemorate the tenth anniversary of the declaration of a republic but this never materialised. South African Ambassador Harry Schwarz presenting the new flag to the U.S. president Bill Clinton and vice president Al Gore in May 1994. The present South African national flag was first flown on 27 April 1994, the day of the 1994 election. However, the flag was first intended to be an interim flag only, and its design was decided upon only a week beforehand. The choice of a new flag was part of the negotiation process set in motion when Nelson Mandela was released from prison in 1990. When a nationwide public competition was held in 1993, the National Symbols Commission received more than 7,000 designs. Six designs were shortlisted and presented to the public and the Negotiating Council, but none elicited enthusiastic support. A number of design studios were then contacted to submit further proposals, but these also did not find favour. Parliament went into recess at the end of 1993 without a suitable candidate for the new national flag. In February 1994, Cyril Ramaphosa and Roelf Meyer, the chief negotiators of the African National Congress and the National Party government of the day respectively, were given the task of resolving the flag issue. A final design was adopted on 15 March 1994, derived from a design developed by the State Herald Fred Brownell, who had also previously designed the Flag of Namibia. This interim flag was hoisted officially for the first time on the 27 April 1994, the day when the nation’s first fully inclusive elections commenced which resulted in Nelson Mandela being inaugurated as South Africa’s first democratically elected president on 10 May 1994. The flag was well-received by most South Africans though a small minority objected to it; hundreds of Afrikaner Volksfront members in Bloemfontein burned the flag in protest a few weeks before the April 1994 elections. The flag flying at the Sydney Cricket Ground. The proclamation of the new national flag by South African President F. W. de Klerk was only published on 20 April 1994, a mere seven days before the flag was to be inaugurated, sparking a frantic last-minute flurry for flag manufacturers. As stated in South Africa's post-apartheid interim constitution, the flag was to be introduced on an interim probationary period of five years, after which there would be discussion about whether or not to change the national flag in the final draft of the constitution. The Constitutional Assembly was charged with the responsibility of drafting the country’s new constitution and had called for submissions, inter alia, on the issues of its various national symbols. It received 118 submissions recommending the retention of the new flag and 35 suggesting changes to it. Thus on 28 September 1995 it decided that the flag should be retained unchanged and accordingly it was included as Section One of the Constitution of South Africa which came into force in February 1997. The South African government published guidelines for proper display of the flag at designated flag stations, in Government Notice 510 of 8 June 2001 (Gazette number 22356). These rules apply only to official flag stations and not to the general public. The Southern African Vexillological Association (SAVA), a non-official association for the study of flags, published their own guide for proper display of the flag in 2002. This guide has no official authority but was drawn up with generally accepted vexillological etiquette and principles in mind. The National flag shall be rectangular in the proportion of two in the width to three to the length; per pall from the hoist, the upper band red (chilli) and lower band blue, with a black triangle at the hoist; over the partition lines a green pall one fifth the width of the flag, fimbriated white against the red and blue, and gold against the black triangle at the hoist, and the width of the pall and its fimbriations is one third the width of the flag. It has a green Y-shaped band that is one fifth as wide as the flag. The centre lines of the band start in the top and bottom corners next to the flag post, converge in the centre of the flag, and continue horizontally to the middle of the free edge. The green band is edged, above and below in white, and towards the flag post end, in gold. Each edging is one fifteenth as wide as the flag. ^ a b Brownell, Frederick G (2015). Convergence and Unification : The National Flag of South Africa (1994) in historical perspective, (PhD). Pretoria: University of Pretoria. hdl:2263/50847. ^ Flags of the World. "South African Vessels Ensign". Retrieved 20 March 2005. ^ Volker Preuß. "Südafrika – Großbritannien Flaggensystem eingeführt" (in German). Retrieved 26 May 2008. ^ Merchant Shipping Act 1951 (South Africa); South Africa Government Gazette No 6085 dated 25 July 1958. ^ Brownell, F. G. (1993). National and Provincial Symbols and Flora and Fauna Emblems of the Republic of South Africa. C. van Rensburg. ISBN 978-0-86846-074-1. ^ "New flag". The Glasgow Herald. 12 September 1968. p. 18 col C. Retrieved 18 April 2016. ^ a b Antonio Coppola (24 May 2018). "Raising of the New South African Flag" – via YouTube. ^ "South African Election Special, 2". C-SPAN.org. ^ "Finding Symbols For New S. Africa // Citizens Submit 7,000 Flag Designs". 27 October 1993. Archived from the original on 8 October 2016. ^ "Fred Brownell: The man who made South Africa's flag". BBC News. 27 April 2014. Retrieved 27 April 2014. ^ Bornman, E. (2006). "National symbols and nation-building in the post-apartheid South Africa". International Journal of Intercultural Relations. 30: 383–399. hdl:10500/23252. ^ "No need to get in a flap over flag etiquette". IOL News. 12 September 2002. Retrieved 23 March 2013. ^ "Schedule 1 to the South African Constitution, 1996" (PDF). Department of Justice and Constitutional Development. Retrieved 21 January 2014. Saker, Harry (1980). The South African flag controversy, 1925-1928. Cape Town: Oxford University Press. Pama, C (1984). Die vlae van Suider-Afrika (in Afrikaans). Tafelberg. ISBN 978-0-624-02070-7. Brownell, F.G. (March 1994). "The Union Jack over Southern and Central Africa: 1795–1994". SAVA Journal. ISBN 0-620-18833-2. Van Zyl, J.A. (April 1995). "The History of Flags of South Africa before 1900". SAVA Journal. ISBN 0-620-19798-6. 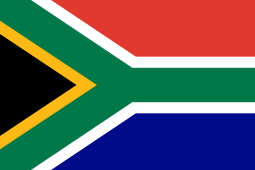 Wikimedia Commons has media related to Flags of South Africa.